Batik brush - a bit akin to Chinese calligraphy technique. Had the opportunity to visit one batik workshop today and immediately struck by this relatively new technique. Usually the batik technique is tjanting which includes drawing design with wax using the tjanting (small copper wax container) before it is colored and processed further. Another technique is the silkscreen technique which is similar to doing t-shirt design manually. For Batik Brush is is actually quite simpler. A brush would be used to draw design using permanent dyes, a bit like Chinese calligraphy technique, then a soak in a solution to make the dye permanent before washing to move the excess dyes. 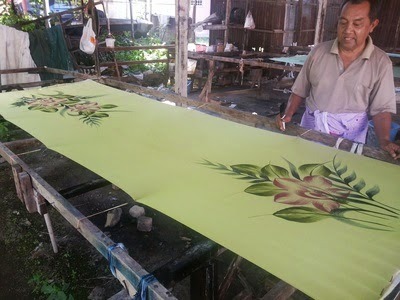 However, the artisan need to be very skillful and experienced as this type of batik is easily damaged when there are mistakes makes in the design as opposed to the tjanting method in which you can cover your mistaked by waxing over it. For example, the uncle here had 21 years of experience under his belt. 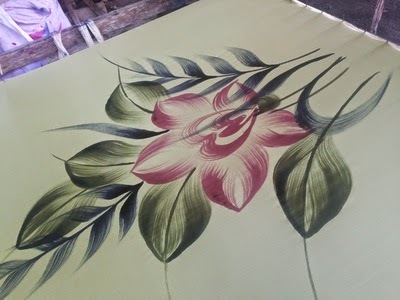 Can see the meticulous painting of the leaves and the petals. In a way, there are no doubt that a kaftan is a masterpiece of its own.